When I was a child, Mahashivaratri bhajans used to be conducted at home. It meant 24X7 work for my parents, especially my mother. But this is the one festival that we loved to get ready for. You had to prepare in advance for hosting so many people overnight. They had to be comfortable yet alert because no one who stays can be allowed to fall asleep unless they are unwell or on medication. So, if there were aunties who wanted to take a ten-minute nap, I would time it and call them exactly in ten minutes! The joy of watching grown-ups make a fool of themselves over getting few more minutes of sleep cannot be underestimated especially when you are ten or twelve years old! Perhaps it is those beautiful growing up years that make it difficult for me to stay away from an all-night vigil during Mahashivaratri. I can't stay away from it no matter where I am, even if the following day is a working day. This year too, I attended the Mahashivaratri bhajans at the Sai Center, Lodhi Road, and I enjoyed every minute of it though I was alone. The only occasions when I have seen my mother make an effort to ''dress up" is for bhajans and festive occasions, but even that is confined to wearing a 'pattu saree' (silk saree with traditional borders) or a Kerala kasavu saree. She would wear a big red bindi and then ''dressing up" is over. No face cream, no foundation, no rouge, no eyeliner or kajal and if you suggested lipstick, she would have been scandalised. If you must know, she has to be ''forced" by us to wear such things for occasions like weddings. Personally, I think she never needed it. She looks beautiful the way she is. 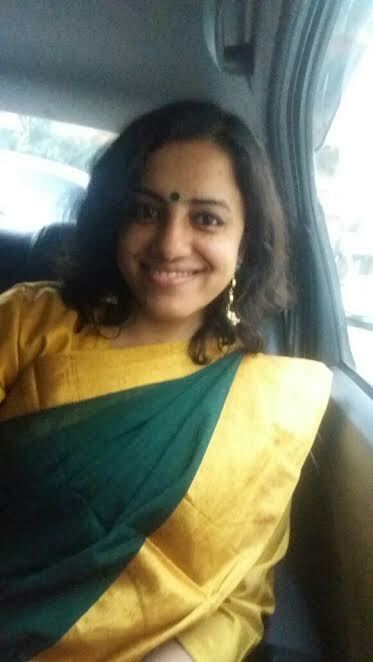 Coming back to my Mahashivaratri routine this year, I made an effort to get ready, wearing a traditional forest green saree with a gold brocade. Green is my mother's favourite colour. There is a tiny shop in my neighbourhood where I like to buy bindis and earrings. The owner is a lovely lady with an excellent taste for the loveliest pieces of hand-crafted jewellery that she picks up on her travels across the country and her recommendations have always been ''god-sent'' for me because I am quite hopeless with colour-coordinating these things. Also, the truth is that I can spent hours reading a book but I don't have that kind of patience when it comes to choosing what to wear, getting ready, etc. I had to reach the venue at least by 6 PM and I stopped on my way at her shop for bindis. 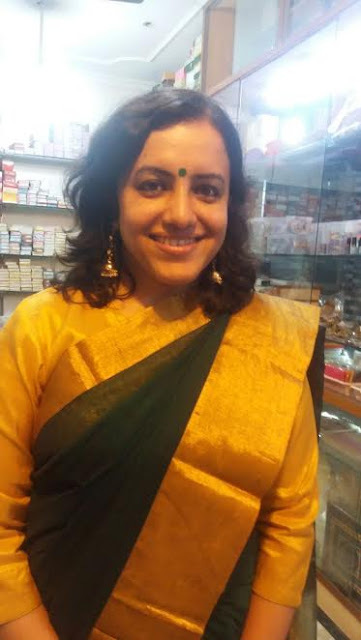 I opted for a small green bindi and almost bought it when she gently put something else for me - a big green bindi - and said, "You should wear big bindis - you look transformed. See it yourself." I was really not keen on having that big bindi - only Usha Uthup can carry it off! Then I looked in the mirror and what I saw surprised me. I felt I could see my mother in the mirror, not me. Do I look like my mother? No one has ever told me so. But when I wore that bindi, I felt the resemblance strongly. And I felt intensely like her. "I think I will have the set of bindis instead of one," I told the lady and she smiled an ''I-told-you-son" gentle smile. I was about to pay the money for the bindis when I saw a beautiful pair of earrings - black studs latched on to green drops - that took my breath away. When I wore the earrings, she clicked this picture and said to me, "Nothing looks more beautiful than this right now. See?" You can see the earrings here if you look closely. You can also spot the stacks of bangle boxes in the background - this isn't a shop. It's a treasure trove, I tell you. 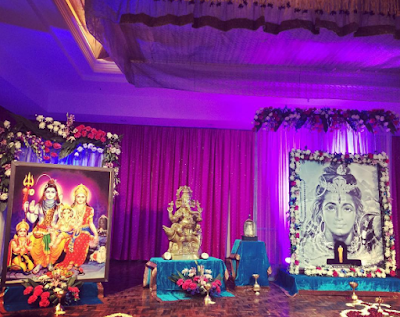 From here, I headed to the venue, where the bhajans were in full swing. So, what happens during the Mahashivaratri vigil? As a Sai devotee, I sing my lungs out. That sounds too easy, right? But singing all the way with the same spirit and energy till 6 AM the next day isn't a walk in the park unless you feel it with every cell of your body. At a much deeper level, there is a lot happening - a sincere attempt to let go of the ego, desires and all the baggage that ties you down in material life. Anything that you believe ties you down - work on it. When I listen to Sai bhajans, I lose interest in everything else including who I believe i am and who I want to be. I forget my deepest grief, my strongest desire and my identification with myself. All that I become alive to is the ragas, the svaras, the lyrics and the feel of each bhajan that wraps itself around my consciousness like the peaceful stillness of a frosty morning. A bhajan sounds simple and people think that anybody can sing but that is not true. You can be an amazing playback singer and still be mediocre when you sing a bhajan. It takes years of dedicated sadhana to become a good bhajan singer and even then not everyone can claim to reach that position easily. The difficult thing is that you have to motivate yourself - there are no masses clapping for you, no awards coming your way, no rewards or recognition to make your ego feel on top of the world. The only reward that comes from it is the unbelievable satisfaction you feel within when you have sung well. For yesterday's bhajans, I loved the dash of strategy shown. The best singers and the best bhajans were rendered during the 1 am to 4 am slot - the time when we are most likely to fall asleep. Even the combinations of singers are deftly arranged - among women, the older voices merging with the younger voices to give both the strengths they needed in mastering the song and rendering it with amazing skill. When you open your eyes after singing or listening to a bhajan, the sunrises and sunsets should feel differently to you. This isn't merely about technique but it is about breaking every rule in the written book to understand the essence of the bhava that you are striving to create for your listener. One such bhajan that has been lingering in my mind since Mahashivaratri is this, "Arunachala Shiva,Arunachala Shiva,Arunachala Shiva Aruna Shiva Om." A beautiful bhajan, but I couldn't grasp the tune or the rhythm of it. That this bhajan is elusive and slipping out of my grasp is now filling my mind completely. Also, a tiny egoistic voice that pips in, "You think you know all bhajans, couldn't figure out this one, could you?" As the early morning aarti rang out on the morning after Mahashivarathri, the sky seemed to shimmer, the air seemed colder and the lamp lights from the place where we had completed worship of Lord Shiva glowed around us as the hurrying figures of devotees moved past. Utter beauty and serenity - that is what Mahashivaratri means for me. Brings joy and peace to my heart like nothing else. So, what's your favourite way of feeling at peace with yourself? I'd love to hear from you! I wish I was there too. I could feel the energy thru your piece. So wonderful to forget your ego while singing and being one with the energy!! Sona, you look beautiful big bindi or not, but absolutely reminded me of pics of your mom too!! A well written post! you have a magical ability to weave in Shiva, your mother, bindi shopping and Shivaratri in your writing to show us joy and peace. maybe someday, fingers crossed. And thank you for saying that I resemble Mom - that's the best compliment ever, Anu. Vishnu, thanks a ton! Happy that you enjoyed reading this post on Shivarathri. you look so beautiful and this has been so beautiful post of yours.